The Department of Mechanical Engineering has organized an Industrial visit at Bharat Fritz Werner on 15th September 2018 for semester Vth B&C semester students. 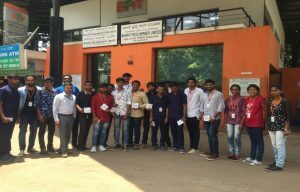 Prabhakar C G and Lava, Asst Professors, have been travelled to the company along with 30 students at 9.30 A.M and took about a one and half an hour to cover the distance. The company is located at Off Tumkur Road, Yeshwanthpur, Bengaluru, Karnataka 560022. Mr. Prashanth Kumar, HR, was given introduction about company followed by visiting each department in the company such CNC milling section, Advanced Milling centres, Advanced CNC lathe Machine Sections and Painting and Assembly section. Interaction of Mr. Anil Krishna, an alumnus of NCET with 7th Semester Mechanical Engineering Students.